HELSINKI, August 28. /TASS/. General Staff of the Finnish Defense Forces did not allow the Russian Kruzenshtern barque to visit the Aland Islands, the republic’ s autonomy, in late September, the Hufvudstadsbladet newspaper wrote on Monday. According to the newspaper, The Kruzenshtern with 164 students on board planned to call at Mariehamn on Aland, a demilitarized zone, on September 18-20. A foreign vessel is to request for a permission to visit Finland’s territory, and the General Staff chose to refuse the application. The Defense Forces do not comment on the decision. In July, the barque visited Finnish ports of Turku and Kotka during Europe’s biggest regatta Tall Ships Races. At that time, an Aland delegation visited the vessel. The islands, the newspaper writes, hoped the call of the big windjammer could add to Aland’s chances for hosting the Tall Ships Races in 2021. Finland’s authorities may be unhappy about the fact their vessels are not allowed to the demilitarized islands’ port, while a foreign training ship has no problems with it, the newspaper wrote. TASS as yet could not receive comments from the Defense Forces. The Kruzenshtern, a four-mast barque, was built in 1926 at Geestemnde in Bremerhaven, Germany and was given the Italian name of the Padua (after the eponymous Italian city). She was surrendered to the Soviet Union in 1946 as war reparation and renamed after the early 19th century Baltic German explorer in Russian service, Adam Johann Krusenstern (1770-1846). She is now a Russian Navy sail training ship. Of the four remaining Flying P-Liners, the former Padua is the only one still in use, mainly for training purposes, with her homeports in Kaliningrad (formerly Koenigsberg) and Murmansk. 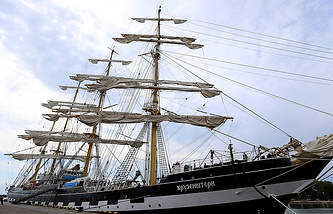 After the Sedov, another former German ship, she is the largest traditional sailing vessel still in operation. Over its 90-year history, along with participating and winning various international regattas and races, the Kruzenshtern has made two round-the-globe voyages and a trans-Atlantic expedition, covering an overall distance of 1.3 million nautical miles.